Photovoltaic panels must function without failures to produce effective electricity and to preserve a high lifespan. It is thus possible to obtain a good return on investments. 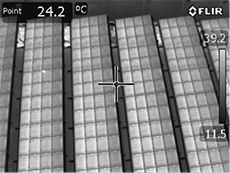 To date, the use of an infrared thermographic sensor remains the simplest and most effective method to control the integrity of photovoltaic installations. 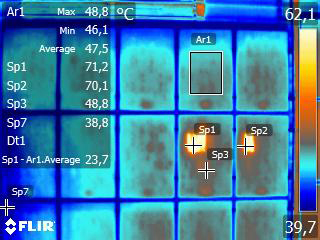 Thanks to air infrared thermography, anomalies are immediately detected on photovoltaic panels. The quality of our multicopter-embarked multispectral camera (visible + IR) makes it possible to cover rapidly great surfaces. Control is carried out during the normal operation of the power station. It is highly advised to regularly carry out these controls, one right after the installation and others in the course of operation. Be sure to carry out a control before the end of your guarantee! Analysis and official report of inspection are carried out by a thermograph qualified in the inspection of electric installations and entitled by the APSAD (Assemblée Plénière des Sociétés d'Assurance Dommage) according to the D19 reference frame (for France). 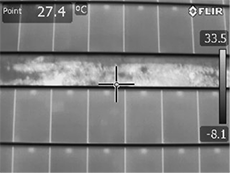 The most commonly defects of photovoltaic installations are identifiable through the analysis of images obtained by infrared thermography (defective cells, solid drop shadows, defective by-pass diode, installation balancing). With the official report delivered at the end of the inspection, you have an explicit document which will be very useful during the discussions you'll have with your fitter or the person in charge of your photovoltaic system maintenance. Its recording will also enable you to follow the evolution of the overall condition of your installation over time. A photovoltaic installation is an assembly of photovoltaic panels made up of a series of basic cells. When these cells are exposed to sun radiations, it produces electricity. This electricity is collected by the structure of the panel for each cell and conveyed in the junction box. Junction boxes are connected between them to the inverter, which transforms electric current produced the cells (DC current) into AC current and injects it into the electric network. 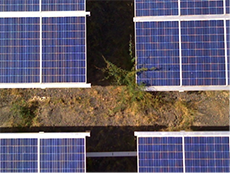 When a photovoltaic cell is degraded, it behaves like an absorbing surface and converts the sun radiation into heat. This heat is detected by the infrared sensor. To date, the method of infrared thermography inspection is the simplest and most effective method for detecting damaged photovoltaic cells or any electric origin heating (junction box, diodes, connectors towards inverter). WHEN DO YOU HAVE TO CARRY OUT A THERMAL ASSESSMENT OF YOUR INSTALLATION? •	In practice, it is necessary to wait for 7 to 10 days of operation (installation running in). A thermal assessment for a new installation carried out by a qualified company is a solid element in a guarantee file for the fitter. 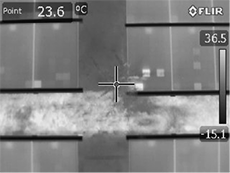 The thermal image obtained from then on gives a precise idea of the new installation operating conditions. Gathered information indicates also the quality of the installation and thus its longevity. •	This inspection must be carried out when there is a difference between the theoretical productivity stipulated in the supplier/fitter contract and the real installation output. Generally the checking method consists in raising the instantaneous production of the photovoltaic installation in its optimal period (full sunning but before or after the hottest hours). The quantity of current produced under these conditions must be close to 80% of the equivalent value in KWc, for a 1000w/m2 exposure (manufacturer data). The image transmitted by infrared thermography will reveal without any ambiguity the possible damaged cells, which are sources of output loss. •	Any intervention subsequent to the installation of panels can damage the installation integrity (micro-cracks during cleaning, bad connection of a replaced panel, bad installation balancing, …). In this case also, thermal imagery will bring invaluable information about the installation condition. Photovoltaic panels mosaic on roof. WHAT IF THE INSTALLATION THERMAL PRINT PRESENTS DEFICIENCIES? -CAT. 1: The difference in temperature measured on at least one cell compared to the average temperature of the healthy cells of the panel is lower than 8°C. CONSEQUENCE: Alteration of the installation operation. ACTION: Have an eye on panel. -CAT. 2: The difference in temperature measured on at least one cell compared to the average temperature of the healthy cells of the panel is 8-20°C. ACTION: Think about replacing the panel and having an eye on the by-pass diodes. -CAT. 3: The difference in temperature measured on at least one cell compared to the average temperature of the healthy cells of the panel is higher than 20°C. CONSEQUENCE: Long-term deterioration of the installation and panel combustion risk (possible failure of a by-pass diode). 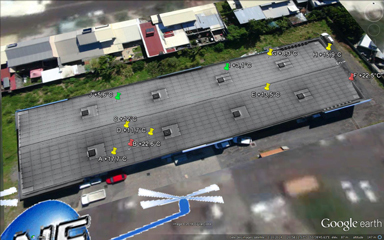 The overflight of the installation allows a first location of hot points (clear spot). Hot points can be isolated cells or cell groups. Sometimes the visible image allows an identification of the origin of the defect (here solid drop shadow). Infrared sensor sensitivity allows the control of the junction box heating. On this image, you can see an abnormally hot junction box.